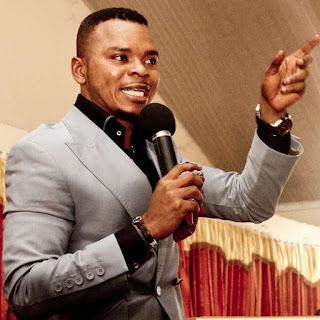 Founder and Leader of God’s Way International Church, Bishop Daniel Obinim has pleaded with Ghanaian rapper Sarkodie to try as much as possible and marry Tracy, his baby mama in 2018. Sarkodie has been dating Tracy for close to 2 decades and has one adorable baby girl together but Sarkodie is yet to marry Tracy as far as the Ghanaian public knows. It’s been alleged Sarkodie has secretly married Tracy away from the public eyes but as it stands, most people do not believe those rumors. Well, Sarkodie tweeted his New Year message to his millions of fans but his tweet received an unusual reply from Angel Obinim as Bishop Obinim is popularly called. Sark tweeted: “Happy New Year everybody!!! 2018 will be good. God be with us all… let’s love more“. 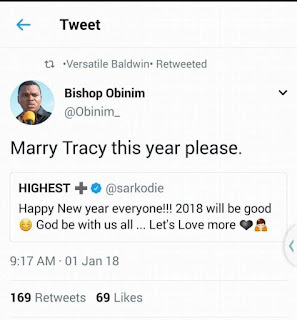 And Bishop Obinim out of the blues replied King Sark “Marry Tracy this year please”. Dawuroo.com is yet to verify if the “Bishop Obinim” account on Twitter is really for the man of God or it’s just a spoof.